The Brothers and Sisters of the Ephrata Cloister created a treasure trove of Early American music. Conrad Beissel, their brilliant, spiritually-androgynous leader, wrote some of the earliest music in colonial America. Beissel's ethereal, other-worldly choral compositions survive today in song books that were penned and printed at the Cloister. 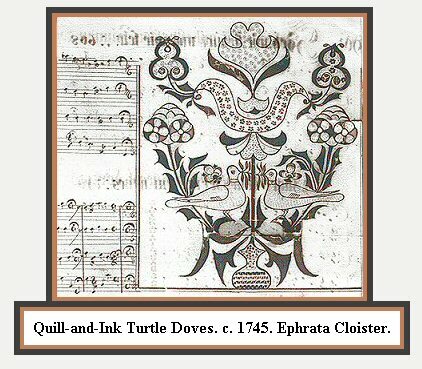 In 1747 the Brothers printed a landmark book of American musicology, the Turtel-Taube (Turtle Dove) hymn book. In this book, Beissel explains his unique theories of music composition. This is the first American essay on music harmony. The book also includes the lyrics to hundreds of hymns sung at the Cloister. 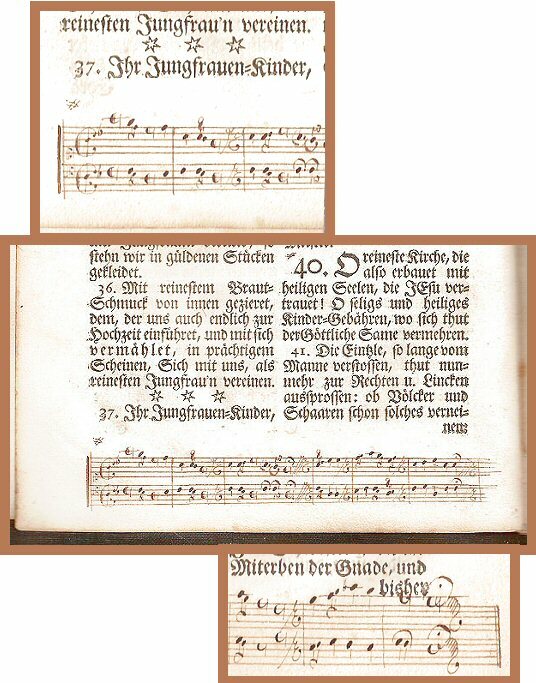 Many of these hymns were composed by Beissel, who wrote their lyrics and scores. 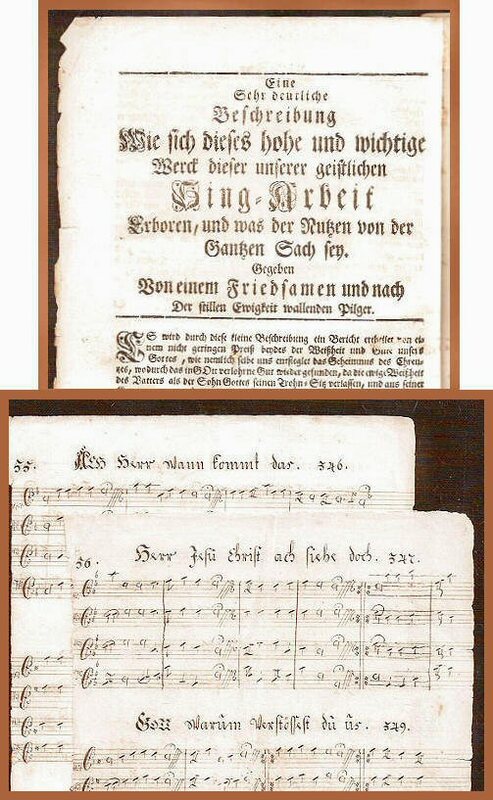 In the previous year, 1746, three Brothers had worked most of the year to produce an ornate hand-written music book, on which this printed music book is based. 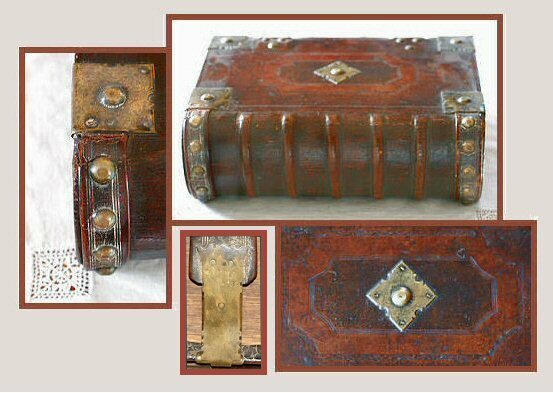 The Cloister gave that manuscript music book to Ben Franklin, who in turn gave it the the Mayor of London. In 1927 that hand-written Turtel Taube book was purchased by the Library of Congress, where you can see it Here and Here. 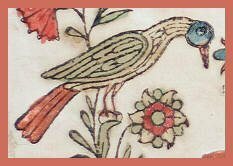 The book I show here, on my site, is the second printed edition (1749) of this iconic Turtle Dove music book. The margins of many pages in this printed edition have hand-written musical notation, penned by anonymous Cloister scribes. Above: An anonymous Cloister scribe penned music notation onto the margins of this Turtle Dove book. Below: "Sing-Arbeit": This is the first page of Conrad Beissel's dissertation on choral harmony, which is printed in this hymn book as a preface to the hymns. This work is the first treatise on music harmony published in America. Above: An anonymous Cloister scribe penned music notation onto the Turtle Dove hymn book's margins. 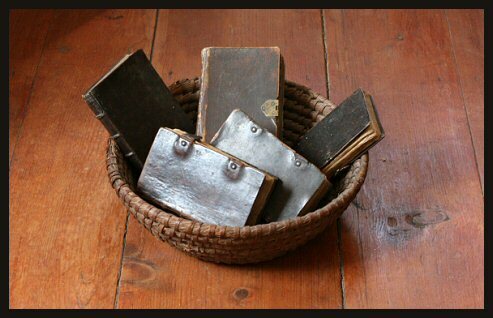 He or she also inserted these manuscript music pages, looseleaf, between the pages of this book. Below: This is the first hymn printed in the Turtle Dove hymnbook. 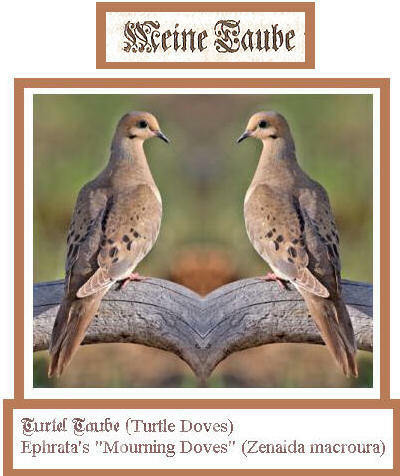 Below: In 1747 this species of Turtel Taube (Turtle Doves) sang their songs in the apple trees at the Ephrata Cloister, competing with Beissel's chorales. White-robed reenactors continue singing at the Cloister today. So do these turtle doves. Above: Click Image to Enlarge. Collectors of American folk art love the Ephrata Cloister. 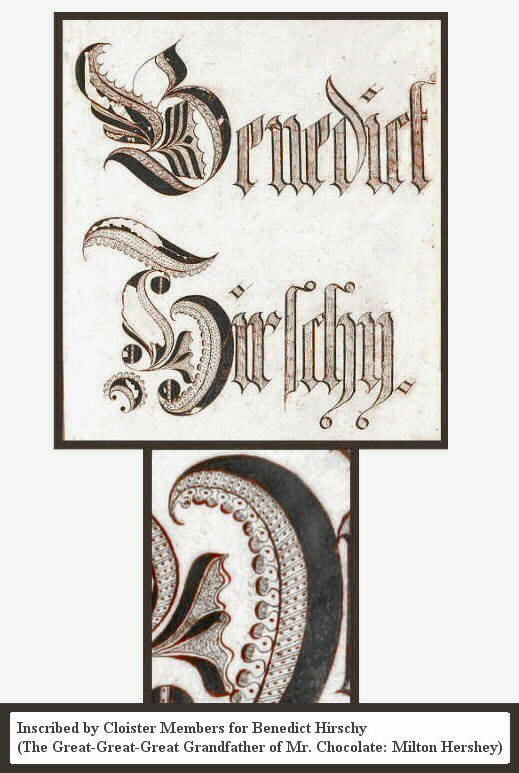 Ephrata's mystical Brothers and Sisters created icons of Early American art ...masterworks of Pennsylvania German calligraphy and pen-and-ink design, including the earliest fraktur drawings created in America. The Brothers of the Ephrata print shop were no slouches in the masterworks department. In addition to creating landmarks of American book arts, these printers also produced fraktur taufscheins (letterpress birth and baptism certificates). Local scriveners infilled these fraktur-font documents with color and calligraphy, to record, forever, the birth or baptism dates of their neighbors. 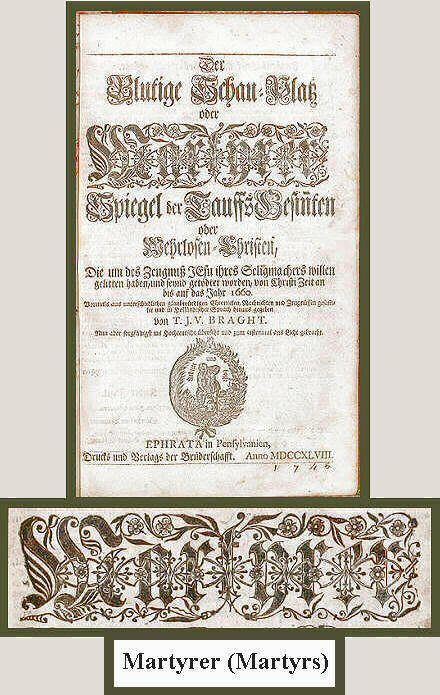 In the early 1780s, the Ephrata printers created the first printed American taufscheins (birth or baptism certificates). 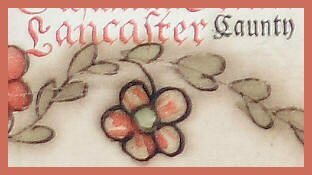 Sometime circa 1784, a teen-aged Mennonite girl named Susanna Greider (Kreider), living in Lancaster Township, received one of these first taufscheins, which I show here. 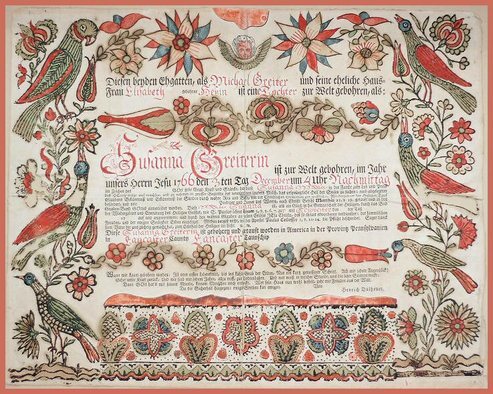 Susanna's family purchased this fraktur document from the eccentric scrivener Henrich Dulheuer, who penned Susanna's birth details onto the paper in red ink. Durng this time, Henrich was living in East Hempfield Township, with the Musselmans, a Mennonite family. The Ephrata print shop had commissioned a local, non-Cloister artist, Henrich Otto, to paint horizontal bands of ink-and-watercolor vines and flowers to this document. To top it all off, the Brothers printed their favorite winged angel, top and center. (Or is it the Virgin Sophia?) Whoever he/she is, she apparently was composed of lead: a type-metal cut. She was a popular angel; Christoph Saur and Francis Bailey both printed her countenance in their print shops. 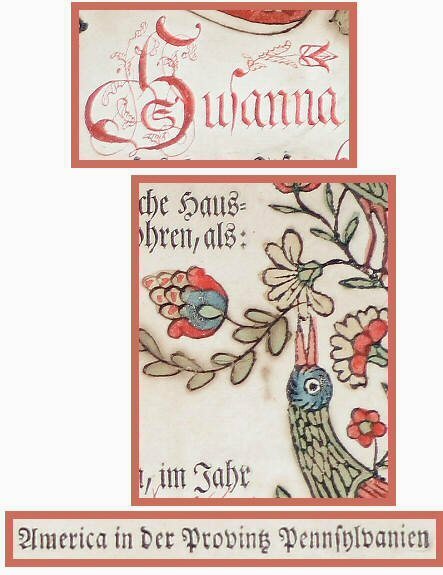 Susanna probably didn't care about her taufschein's printing details. She was just glad to know that someday someone would be reading about her on the Internet. P.S. Thanks to the late Klaus Stopp for publishing his monumental, 6-volume study of Pennsylvania tauf-scheine. Beginning in the mid 1700s, American printers became enamored with the finely-crafted British fonts designed by William Caslon, an English gunsmith and typeface designer. Caslon fonts became some of the most popular typefaces of that century, throughout the English-speaking world. ...and the Pennsylvania-German speaking world. A Caslon type specimen sheet is Here, if you want to try to figure out if these Cloister fonts are "real" Caslon or "competing-with" Caslon. 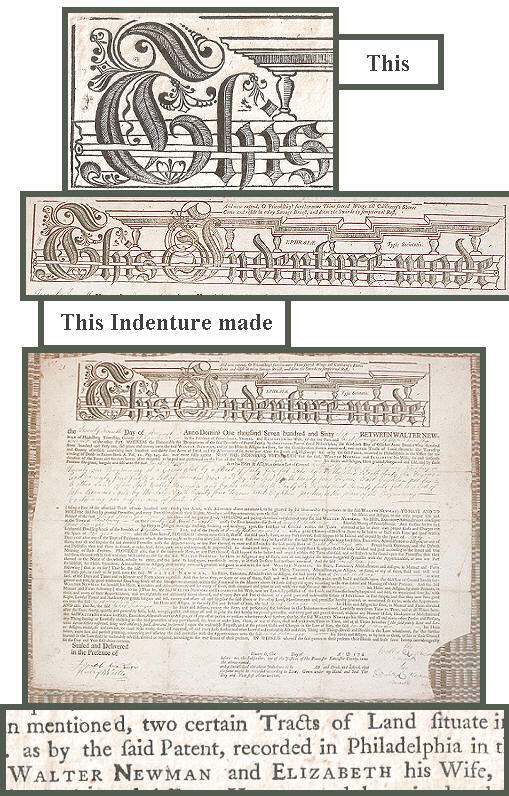 In 1766, John Dunlap used Caslon fonts to print the Declaration of Independence. Even today, Caslon is always a safe bet. 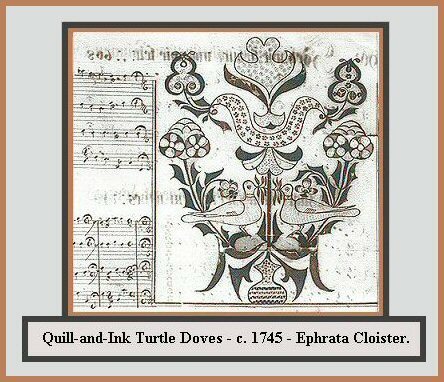 The Ephrata Cloister was an Early American powerhouse of printing and publishing. 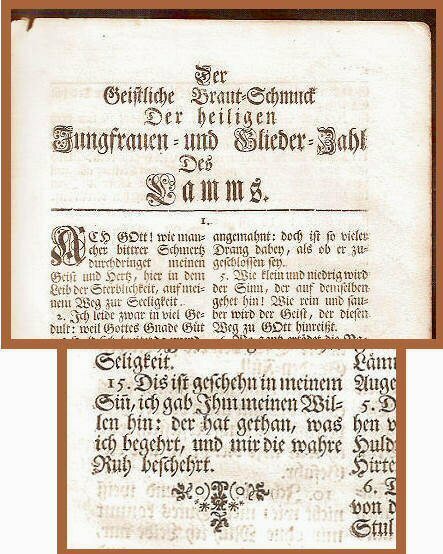 The Arndt and Eck bibliography lists 68 German-language books, pamphlets, and almanacs printed at the Ephrata Cloister between 1745 and 1792. Here are five German-language books printed at the Cloister. The rye-straw breadbasket also is from the Cloister. Christliches Gemüths - Gespräch (Christian Spiritual Conversation) by Gerhard Roosen 1769. Printed for the Mennonites. Creutz-Schule (School of the Cross) by Valentin Wudrian. 1762. Die Ernsthafte Christenpflicht (The Earnest Christian Duty). 1785. The most popular Mennonite and Amish prayer book, even today. Die Ernsthafte Christen - Pflicht (The Earnest Christian Duty). 1770. The most popular Mennonite and Amish prayer book, even today. Die Ganz Neue Testament (The Complete New Testament). 1787. 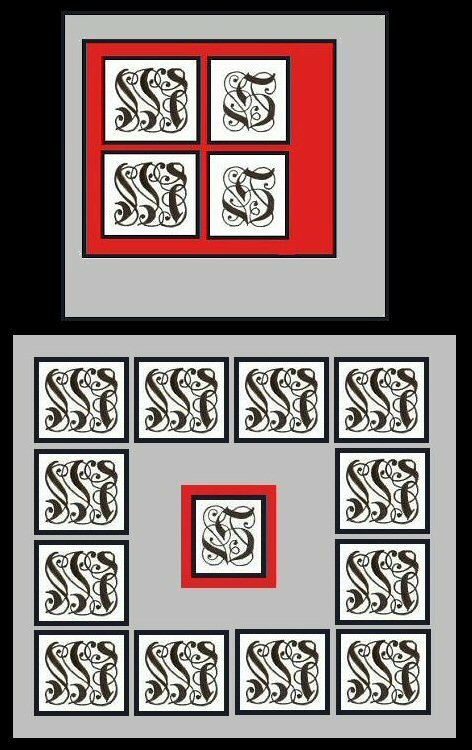 Peter Miller, of the Ephrata Cloister, used this display font in his 1748 Martyrs' Mirror, the largest book printed in Colonial United States. This font is hugely important to the history of American printing, because it also appears as the first font on the first type specimen printed in Colonial United States: the ca. 1740 broadside printed by Christopher Saur in Germantown (near Philadelphia) to advertise his printing services. Today, one of those Saur broadsides is in Philadelphia, in the collection of the Historical Society of Pennsylvania. 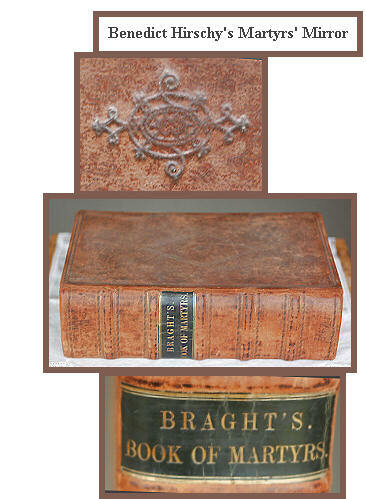 These ornate letters M and S appear throught the Martyrs' Mirror, a book about Christian martyrs. 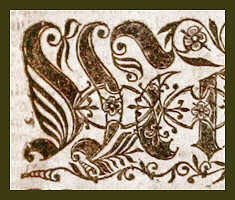 Saur identifies these large letters as "Sabon." They were designed by an anonymous typographer in Germany, at the Luthersche type foundry in Frankfurt. Detail of the first type-specimen advertisement printed in Colonial United States. It is a broadside printed by Christopher Saur in Germantown, near Philadelphia, ca. 1740. 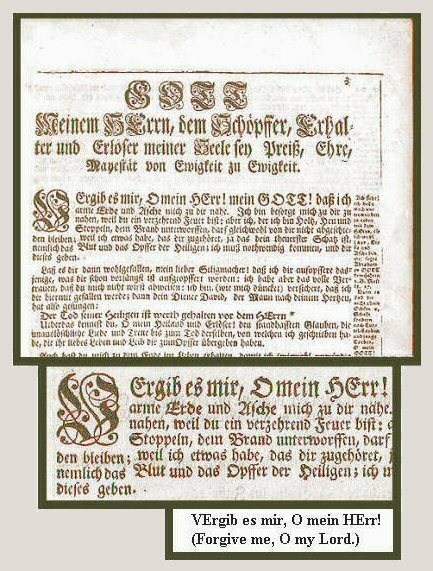 Peter Miller used this same "Sabon" font in his 1748 Märtyrer Spiegel (Martyrs' Mirror).